Whiskey Creek is closed to public access. However cabins are available to rent. And there are a limited number of campsites that can be rented by the month for camper trailers. I would say 1 to 2 pieces of jewelry quality glass would be the best you could expect to find. I've lived a mile up the road from Whiskey Creek for 8 years now, and have beach rights, and I have never found red glass. Mostly blue's and greens. There are some agates and small fossil snails however. That beach is privately owned. It is posted as closed. 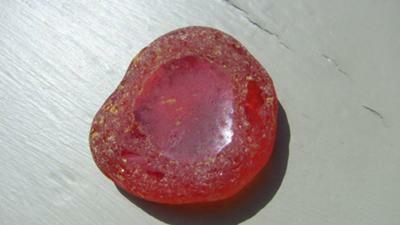 I just found a quarter size red beach glass. It has sort of a rim around it like it was either a jar or light. Pretty cool and lots of fun finding it. In the mid 80's my husband was fishing in Kodiak Alaska and I was beachcombing on a bay in town. instead of rocks and shells, I picked up a variety of glass shards and pottery. I put them away thinking they had no value until today in the Parade magazine is an article on beach glass. I have a green one, 1" with letters on it, several brown ones and the biggest is a red one, 2" in diameter, along with pottery shards. I asked a local who told me there was a bar in the 30'sup the shore, that when they finished a bottle, it was thrown out to the water. Is there any value to these pieces?